This good looking fellow is Hunter. 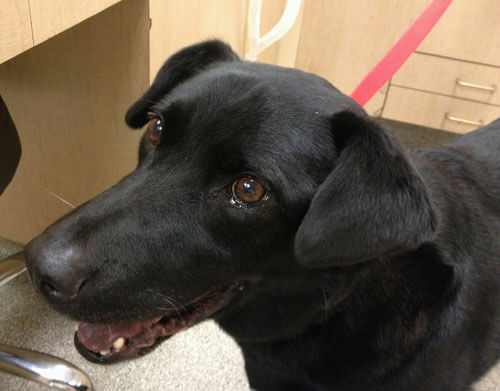 Hunter is a four year old lab mix who was recently backpacking with his owner near Bend. They were having a great time until Hunter was distracted by something, possibly a jackrabbit and took off running. Unfortunately for Hunter, by the time he stopped running his owner was no where to be found. He was lost for 5 days in sub zero temperatures and his owners had almost given up hope when someone found him in the woods and from his i.d. tags were able to contact them. He was quickly reunited with his parents who brought him in for an exam. He had some mild abrasions on his feet and a swollen left foot. X-rays of his foot were negative for any broken bones so Hunter was sent home with some antibiotics and pain medication to help him recover. After several days his wounds were still not healing. Another checkup was performed which revealed that he had frostbite. His left hind foot had several areas that had been affected. After several wound therapies and bandage changes Hunter is now on the road to recovery. Due to such bravery during this ordeal we would like to congratulate him on being this month’s Pet of the Month.